Justin played Skyrim for PlayStation VR at E3... he learned a lot about himself in the process. Announced during the PlayStation Media Showcase at E3 2017, Bethesda’s sprawling milestone RPG The Elder Scrolls V: Skyrim is coming to PlayStation VR. 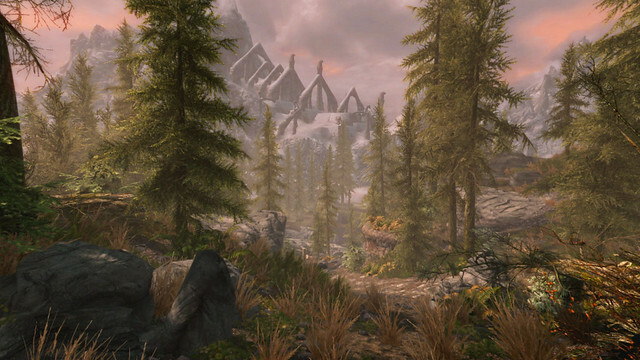 This isn’t an add-on experience or a demo intended to showcase the potential of the hardware — this is the full Skyrim experience in its entirety, including all of its well-received post-release content. I played Skyrim VR with a pair PS Move controllers, but Bethesda is building in DualShock 4 support as well. Each controller is mapped to one of your hands, and each hand can be equipped with a sword, shield or spell (or a bow and arrow, which occupies both hands). Attacks feel natural, with a sword swing dealing substantial damage to enemies within melee range. Stabbing motions yielded no results in my demo — Bethesda is sticking to slashing motions for hand-to-hand combat to keep things balanced. Ryan and I talk to Andrew Scharf from Bethesda about bringing the landmark RPG to virtual reality. Wielding a bow and arrow is especially fascinating. It’s a fairly one-to-one affair, requiring the player to maneuver the PS Move controllers into position to nock an arrow, hold the right trigger, pull the controller / arrow back, and release the trigger to send the projectile on its merry, violent way. I noticed no auto-aim assistance here, so it took me a few tries to actually peg an enemy soldier firing volleys back at me — all the more satisfying when I finally landed that precision shot and took him down. 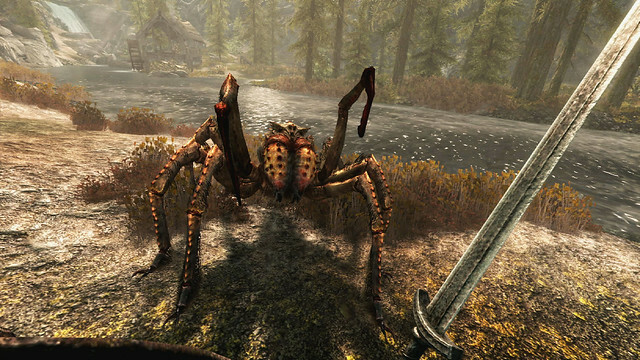 Finding the right balance between player immersion and comfort is important to the team bringing Skyrim to PS VR — good news, since this is the full, dozens (hundreds?) of hours’ worth of gameplay we lost ourselves to a few years ago. During my demo, movement was controlled by holding the PS Move button on the left controller to bring up a blue orb, which you could then move to any spot within a few-foot radius, then let go to teleport there. Pressing the two bottom face buttons on the right PS Move controller shift your field of vision a few degrees to the left or right. Once I became more comfortable with this setup, I was blinking around mountain paths and through trap-filled dungeon hallways with blinding speed — unexpectedly making me feel more nimble and mobile than with standard controls. That said, Bethesda is planning to include options for more traditional movement, which players will be able to adjust depending on their comfort level. Perhaps the most exciting moments I experienced during my short time with Skyrim VR were those when I was able to dual-wield a spell in each hand. Full, independent control of each hand meant that I could equip dual fire spells and rain superheated justice upon any foes unlucky enough to exist within my line of sight. “You learn a lot about a person when you watch them play this,” the Bethesda rep manning the demo remarked as he watched me mercilessly torch entire encampments. Perhaps a bit of self-reflection is in order. The Elder Scrolls V: Skyrim comes to PlayStation VR this November. Skyrim is such a perfect fit for VR. Pretty impressive that they’re doing the full game! I’m so pumped for this. I’m really disappointed in the teleport controls, but I am happy it will also have controller support. Sony needs to make something like the Oculus Touch where it has motion controls, but also a Joystic for movement. Resident Evil 7 was great with a controller though. So I’ll just play this with one. @ Spenok: They did. It’s called the Navigation controller. That thing that Sony sold for use in Resistance 3, Killzone 3, Sorcery and Playstation Move Heroes. But that they seem to have forgotten about when integrating motion control into PSVR. I have two sets of Move controllers, and my nav controllers don’t get used anymore. What does Sony have against joystick use for VR? The nav controller does not have the same tracking as the Move controller hence why it’s been abandoned. Why wouldn’t they just utilize the DS4 since the camera can track the light bar. Imo this is the main issue that’s held motion controlled games back. I can understand why they have the teleport with move and walking with controller. It gives you less of a chance of wandering out of the play area and into something that might hurt you or your equipment. I just hope its a fast teleportation just so I can dodge and escape. I got two question that weren’t covered. Will shouts be voice commands using the mike and what about two handed weaposn? How can I honor my nord ancestors if I cant repair and wield wuuthrad? What are the chances those of us who bought the non-VR edition on PS4 can get a price break on the VR edition? Don’t know whether anything like this is happening or not, sorry. Yeah because iv already bought the game 3 times. Would love not to pay full price again for something I own. While I too would appreciate it if this version were available as an add on to the existing PS4 version that I already paid full price for, I understand that there is probably a lot of engineering involved in making this into a successful PSVR experience (e.g., creating a whole new control scheme) that would necessitate this to be a new stand alone product. However, if there is any way possible, please please PLEASE let the save files transfer. I got through about half the game on the PS3 only to have to start over again on the PS4. I would love to play this game in VR, but I don’t think I have the time or patience to start the game from the beginning again a third time. Was never interested in these types of games. But put it in VR & it’s a day one purchase. Things are looking way up for PSVR. Greatness indeed awaits. It really is a great fit for this game. I agree with Star Trek guy. Definitely going to get this on the first day it’s out. Full price again? How many times do you expect us to buy Skyrim? I’d love some discount for the owners of the PS4 version of the game. Since motion sickness is always a problem, a demo would be awesome as well, so I can be sure I’ll be able to spend hundreds of hours in the game without discomfort. I know everybody’s comfort level in VR differs, but for what it’s worth I felt completely comfy using the teleportation / blink movement mechanic they had set up in this demo. Plus, Bethesda told me they’re looking to include movement options users can tinker with so everyone can find their most comfortable play style. Will I be able to add VR to my existing Skyrim PS4 game with a DLC add-on purchase or do I have to re-buy whole game just to get VR added? Okay so lets say I am willing to buy the game twice (well thrice now since I original had it on Xbox 360). Will at least my save files between Skyrim PS4 and Skyrim PSVR be shared? I believe this is a separate game. No word yet on cross-save functionality. Is there an option to play this version on a regular TV with regular controllers, or it this strictly a version for VR? I ask because i do not own a VR headset yet, but if i want to play some Skyrim now then get a VR headset later it would be nice to know. Not sure — I would assume this is VR-only, but I don’t have official confirmation. If you don’t want to play the VR version and want to play it normally on TV then get the Skyrim Remaster that is already out for PS4. @tombraiderwiz The point is that i would then have to buy the game again if i decide to get a VR headset later, which is less then ideal. If i could just buy this version and play it like the regular game, then i could “future proof” my copy and i would only need to buy it once. I personally don’t care for Skyrim VR but I want to know if Skyrim on PS4 will ever get an update to run at 60FPS if the VR game is doing it. Soon as this was announced I was like damn it! Got to buy skyrim again. An experience like this on PSVR, take my $…. again. I’m sure it has been modified a lot to hit that 60fps to then be bumped up to 120fps for PSVR. Wouldn’t expect the base game to get upgraded to 60fps on consoles, but hell you never know. Sony, I’m not sure if you will read this but if you do, you need to make ps move controllers with joysticks for movement. I love how the gun has them but the move controllers need them. Especially for skyrim. Please take my comment into consideration. Thank you! Pre-ordered this as soon as it hit the PlayStation Store. I have skipped out on every version of this game so far, and now feels like the perfect time to jump in. I really hope they can add fluid movement to the PS Move controls. Pressing the move button on the left controller makes you move forward, the right backwards would be great. I was very excited when I first heard about this game coming to vr. I was going to buy skyrim standard edition on ps4 when the price went down. I dd not believe it was worth $60.00 for an old video game, personally. I immediately preordered the game being very excited even willing to pay $60.00 for it, then I found out about the teleportation mechanic being the only way to move at the moment and I was turned off. I played farpoint vr and resident evil vr with regular locomotion and I was fine. The first time I felt a little bit sick but after that no problems at all. Now I am in wait and see mode to see what kind of controls they will have for the game before I even think of buying it now. Just my opinion. I went from never played or cared about Skyrim, to probably grabbing this Day 1. I really hope the traditional movement works well. I’m not really into the teleport mechanic in VR games. Well, Bethesda, you’ve effectively found a way to get me to purchase Skyrim a THIRD time, and to be excited about it. You sorcerers. $59.99 for a 6 year old games guys. Just saiyan. $59.99 for a six year old game in VR. A fantastic game from what I hear. Definitely worth the $60 I’ll pay since I’ve never played it. Any word on mod support? That would be pretty cool. nice! this is looking better and better. I like the blink movement, as most FPS type VR games that don’t have it (ie RIGs) make me a little woozy. Will there be any dual-wielding block mechanics? Man Im super Excited for this game cant wait to play. The fact that consumers aren’t sure whether or not a DLC add on to their existing Skyrim game is going to be made available is ridiculous. How is it that in today’s day and age there could be such tone deaf messaging? Bethesda. Sony. Stop it. Those of us that support you with our Skyrim purchase & PSVR headsets deserve better than your ambiguity. Get it together and tell us what’s what.